Britain’s Eddie "The Beast" Hall reveals how he trained in the run-up to this year’s ultimate test of human strength. From the moment I returned from the 2016 World’s Strongest Man to the moment I set off for the 2017 event, I gave 100%. I didn’t miss one training session, one meal, or one physical therapy or cardio session. I was obsessed. I trained at my usual gym, Strength Asylum in Stoke, England, with my usual training partner, Luke Fulbrook. We didn’t periodize or back off at any point. We just trained heavy all year. The way I train hasn’t changed much over the years. I consistently train heavy but never one-rep max. I work at 80 to 90% of my one-rep max for up to six reps. If I can do more than six reps, I add more weight next time. I’ve followed this six-rep rule since I started training. If I feel good at a weight, I might do more than six reps, but in general, you’ll never see me do more than six. The only thing I changed was that I cut down on assistance exercises for smaller muscles like biceps, calves, and abs. I just didn’t feel they were making any difference. I was putting too much energy and recovery into repairing those muscles when I needed to be focusing on the big, key muscles, like quads and glutes, that do the brunt of the work. Some strongmen have separate days for gym and event training, but I find it more effective to combine the two. If you are going to train yoke, you want to thrash your legs first to get them burned out. You are not only warming up properly but also simulating a competition scenario because it’s highly unlikely you will start an event fresh. 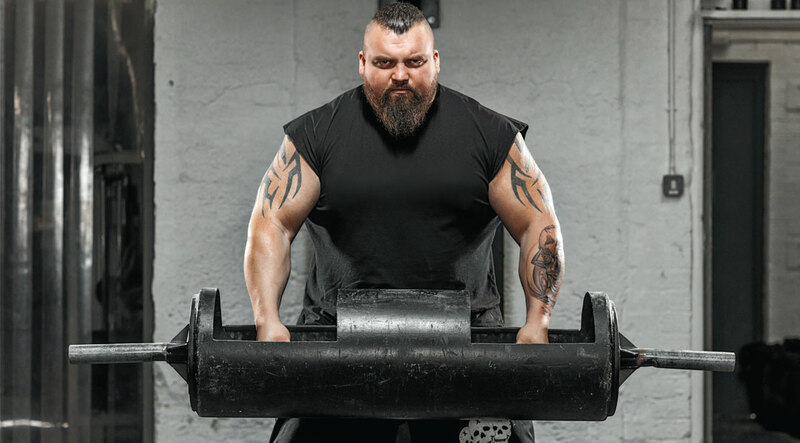 The British strongman became the only the third person to hold the title since 2008. Here’s how a typical week broke down. As you’ll see, it’s pretty basic—it’s what I did out of the gym to recover that gave me an edge over my rivals. Something else I changed from last year, which was very expensive, was that when I trained a muscle group, I had it worked on the next morning by my physical therapist, Richard Sale, for 1½ hours. For example, after I trained legs on Monday, he’d work on my legs on Tuesday morning. I had regular therapy four or five times a week, plus additional sessions to treat any niggles. On average I was having six physical therapy sessions a week, which easily cost over $250. Add up the cost over 52 weeks, and it’s quite pricey. But physical therapy is crucial. I even took Richard with me to the World’s Strongest Man. I also have lots of recovery equipment at home, so after every training session, I’d do hot-cold treatments for at least an hour and then eat. If I had time afterward, I’d go into my hyperbaric chamber for 1½ hours. That’s how I lived for a year. I didn’t have any alcohol, holidays, or nights out with my wife or days out with the kids because they would tire me out too much. My family understood it was what I needed to do to be the best and left me to it. It was 100% dedication. Looking back, I don’t know how I did it. It was a massive obsession to become the World’s Strongest Man. The Beast recently posted a video where he is seen benching two grown men with excellent form.